From left are Professor Franklin Bien, Sangyoon Ji, Byeong Wan An, and Professor Jang-Ung Park. There findings have been published in Nature Communications. Smartphones may soon have fingerprint scanners built into the screen, thanks to new technological advancements by a research team affiliated with UNIST. The new sensor, with the capability to detect both tactile pressure and skin temperature, is expected to enhance device security significantly. transforms entire display into a fingerprint scanner researchers says they have come up with an answer of where to place the fingerprint scanner in an edge-to-edge screen. 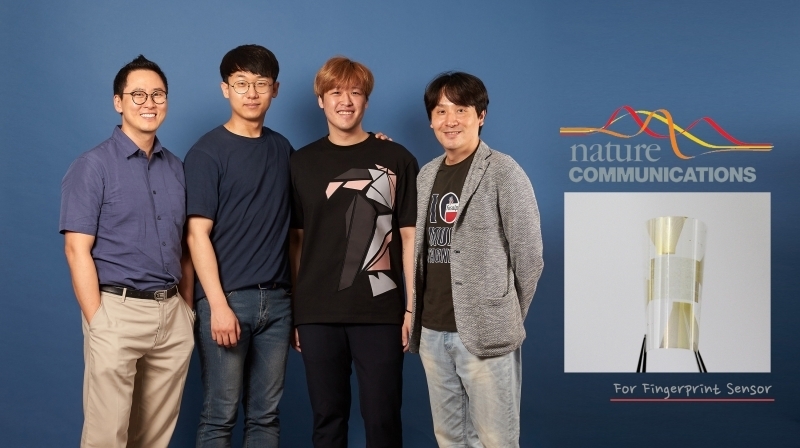 This breakthrough has been jointly led by Professor Jang-Ung Park in the School of Materials Science and Engineering and Proefssor Franklin Bien in the School of Electrical and Computer Engineering at UNIST. The research team anticipates this fingerprint sensor array will be potentially suitable for display integration in smartphones and mobile devices. In the study, the research team has succeeded in developing a capacitive fingerprint sensor technology that is both transparent and flexible. The new sensor offers the sensing capability, in terms of capacitance variation, up to 17 times better than the variation for the same sensor pattern using conventional indium thin oxide (ITO) electrodes. They say the results match up to the standards for fingerprint recognition set by the FBI and the technology will be introduced to the market within the next 12 months. 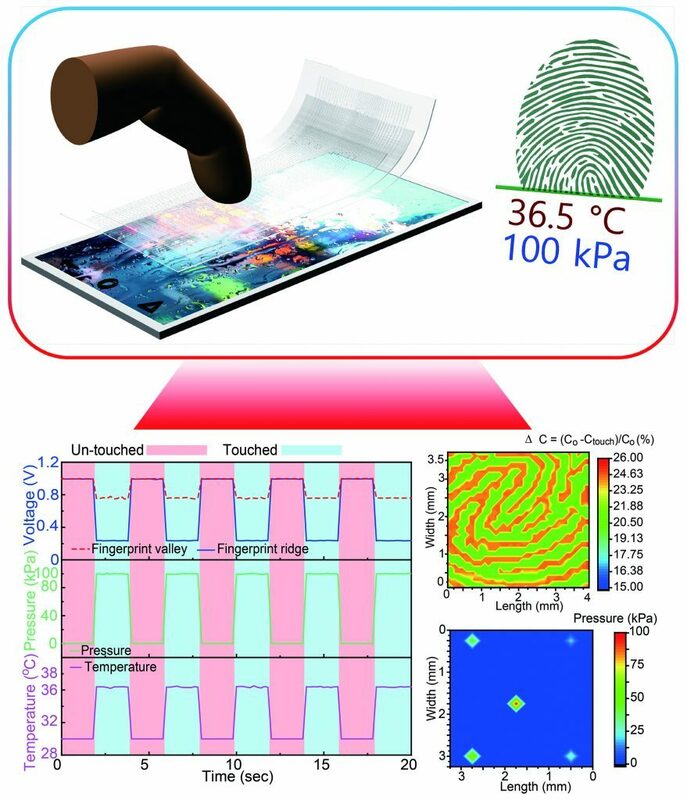 Transparent fingerprint sensor that can simultaneously detect tactile pressure and skin temperature, as shown on this diagram. Fingerprint sensors on mobile devices were initially used as an easy and fast way to access the device, without the need to enter in a passcode. In addition, smartphones nowadays have fingerprint recognition function added to their home buttons, used to unlock phones, log in to apps, and authenticate payment transactions. Recently, with an attempt to expand smartphone screen size, there has been considerable attention drawn to in-display fingerprint scanning technology. Display fingerprint recognition is a technology, used for identifying fingerprints by simply touching the screen with a finger. Based on the fingerprint identification methods, it is divided into optical, ultrasonic, and capacitive types and many efforts have been made, aiming to apply the optical and capacitive fingerprint sensors to the screen. The capacitive fingerprint sensors have high accuracy and can effectively turn the entire display into one giant fingerprint sensor. In addition, they can be made thinner than optical types and less expensive with much simpler structure than ultrasonic types. Human fingerprints consist of unique patterns of ridges and valleys. One way to detect a fingerprint is to sense the changes in electrical charge, created by air gaps between the ridges and valleys. However conventional transparent materials – including indium tin oxide (ITO), which is used to make modern smartphone screens sensitive to touch – are not up to the task. ITO’s resistance is so high that it cannot detect the small variation in electrical charges needed for a fingerprint sensor. The research team solved this problem by combining silver fine nanowires, which have a good transparency, with silver mesofibers, which have a low resistance. This configuration is around 17 times more sensitive to variations in electrical charge than indium tin oxide, the researchers claim. The flexible array is also extremely resistant to bending, making it hard-wearing enough for applications in devices like smartphones and tablets. The findings of this study have been first published online in the prestigious journal, Nature Communications on July 3, 2018. Byeong Wan An, et al., “Transparent and flexible fingerprint sensor array with multiplexed detection of tactile pressure and skin temperature,” Nature Communications (2018).